RUSH: Seth, Greencastle, Indiana. I’m glad you waited, sir. How you doing? CALLER: Hey, Rush, thanks so much for taking my call. CALLER: Super awesome to be on with you. You know, as I think about it, I think the greatest fear of the liberal media, liberals in general, is absolute truth. It’s why they hate you so much. In a political sphere you’re like the commander-in-chief of truth, and you’ve been launching assaults on them now for decades. They hate that. And really back in November of 2016 we, the people, launched an atomic truth bomb into the heart of Washington, D.C., named Donald Trump, and it’s been flying in their faces ever since, and they can’t stand that. It makes me think of an argument that my brother and I had back when I was 7 years old. He was trying to convince me that Santa Claus and the Easter Bunny and the Tooth Fairy, that they weren’t real. And that’s exactly how I see these folks. They’re convinced of something, but just because they’re convinced of it, doesn’t make it true. I ignored all the facts, I got angry with my brother. I flew off the handle because I didn’t agree with what he was saying, even though what he was saying was the truth. And that’s kind of what I see when I look at the liberal media. RUSH: You mentioned Jeff Flake in your talk with Mr. Snerdley. RUSH: — that what he was fighting was this absolute truth. RUSH: Explain that. What do you mean by that? CALLER: — statements that she genuinely believes. RUSH: — is how you are. CALLER: Right. Exactly. But the fact of the matter is, there’s absolute truth, and that’s what the liberals are afraid of. When I watched Jeff Flake I was thinking about that 7-year-old illustration. I was watching a 7-year-old who believed in Santa Claus and believed in the Easter Bunny getting all upset because what Donald Trump is doing flies in the face of what he thinks to be reality. And that’s why he’s so upset, that’s why the liberals are so upset. They’re convinced of something even though the something they’re convinced of is dead wrong, Rush. RUSH: I think you’re on to something with the idea that a certain, definable, inalterable truth in anything will set them off. I do believe that that’s one of the problems they have. 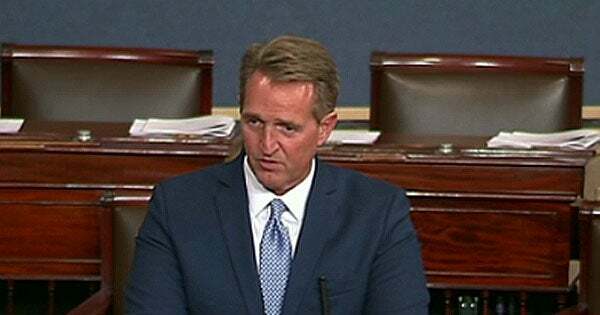 Now, about Flake — and I watched a little bit of the Flake speech, and I’m having a little trouble plugging Flake into the context in which you’re speaking because Flake was on offense and attacking Trump as an abject liar and somebody, if he’s not stopped, doing unfixable damage to our institutions. He compared Trump to Josef Stalin, who mass murdered tens of millions of Russians. A New York Times reporter knew about it and ignored it and was given a Pulitzer Prize for ignoring it. And I try to figure, okay, what is Flake really bugged about? I think all these people protesting the damage Trump is doing to our morality, protesting all the damage Trump is doing to our civility, I think that’s caca. If you want to start talking about people doing damage to our civility and damage to our overall moral turpitude, you don’t have to look at Donald Trump to get there. There are so many predecessors of Donald Trump. I mean, you could focus on Hollywood if you wanted to. You could focus on television shows and movies, in some cases music. You could focus on previous presidents. You could have fun with Camelot and what people have come to learn about that, the moral degradation that has occurred in our country by simply refusing to fight certain kinds of crime because we can’t stop it, so we just normalize it and move on. Defining deviancy down. The idea of focusing on Trump for this, there’s something else behind this. For example, the Never Trumpers on the Republican side, I think one of the things — and there are many — that have them discombobulated is that — and it really is — they are beside themselves that policies they hold dear have been implemented by this lug, by this reprobate, and that they’re working offends the hell out of them because their policies are only really understandable by a select few intellectuals. Another thing — and this may be a bit petty — but I think many of them dreamt of a day when they would be working in government when all of these things for the good are happening, and they have been left out, and they’re nowhere near it. They’re not in the light of success and so forth. They’re outside shouting at it. And there’s more to it than this, but regardless, it’s psychologically deep and it is surprising a lot of people who thought that they were unalterably on our side and we find out how flimsy their support for what we believe in always has been. RUSH: I want to get to sound bite 24. 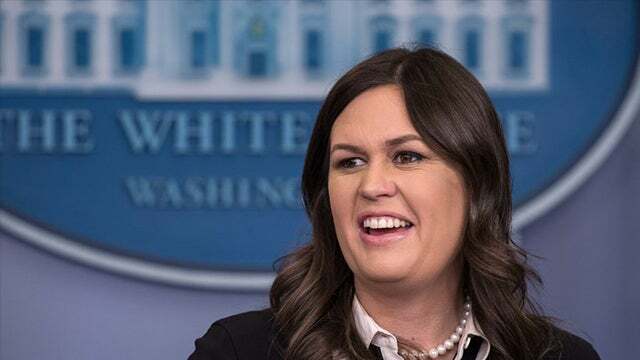 Sarah Sanders. This is the daily press briefing. And John Roberts, Fox News, asked Sanders what she thought of Jeff Flake denouncing Trump from the Senate floor today, and McCain’s statement saying that Trump should stop attacking the medial. That’s basically what Flake said. Flake said this is just beyond the pale. We don’t attack the institution of the media. That’s what authoritarian regimes like Stalin did. We don’t do it. And McCain sent a letter out basically backing up everything Flake said and attacking Trump for daring to attack the great institution known as the press. So John Roberts wanted to know what Sarah Sanders’ reaction was. This is what she said. SANDERS: In response to Senator Flake specifically, I found it quite interesting that he is coming out to attack this president considering he’s one that was recently defending an actually oppressive regime. He went to Cuba a few weeks ago and served as a mouthpiece for the oppressive Cuban government. He’s not criticizing the president because he’s against oppression. He’s criticizing the president because he has terrible poll numbers and he is, I think, looking for some attention. And I said, “Yeah. There have to be some other personal things that just grate Flake about Trump.” I mean, so many Republican establishment types — stop and think of this, folks. Put this in perspective very quickly. You know as well as I do for however long the media has been hammering Republicans as mean-spirited, extremist, racist, sexists, bigots, homophobes, right? So Republicans have done their best to prove they’re not any of that. They have supported amnesty. They have offered to cross the aisle. They have offered to work together with the Democrats. They have offered to help make Washington work. They have offered to do what they can to show Washington can work again, that people can work together. In other words, Flake and the rest of them have responded directly to the criticism the media and the Democrats forced on them. And did it work? No. They continued to lose favor in their own party. They became a bunch of powerless, ineffective placeholders. And along comes who and starts running rings around the media and the Democrats? Donald Trump, who does everything the opposite of the way the Republicans have been told they have to behave and the way they have to speak. They have to be respectful. They have to be tolerant. They have to be understanding. They have to understand the liberals and the Democrats and the media run the show. And they did. They did all of that. It got ’em nothing. It got them reelected but that was it, it got them nothing. And here comes Trump showing exactly how to do it, somebody from outside, somebody who’s not a professional politician by training, therefore not an expert, and starts running rings around the media, around the Democrats, around every Republican that tried to stop him, gets elected president. You can understand how livid they probably are. The anger is that Trump succeeded. They have believed that you can’t win and you can’t triumph and you can’t even make a dent by doing what Trump does. That’s guaranteed death. That’s guaranteed media destruction. And yet Trump is running rings around everybody and is enjoying it. That’s my guess. There’s probably a whole lot more in terms of explaining, but that’s a good start.